Army – Connell Enterprises, Price Constructions, BKD designs, Cliff McGregor & Z. S Price Construction and Renovations. The journey for people in our region have changed a lot over the last 12months. Myself like a lot of people in our region are finding it tough. We have watch the vast amount of money and support flood in and then flood out and yet we still have the need to support those who are less fortunate. I was not in a financial state to donate $1000 but I found a way I could still help. I called upon an army and together we were all able to do our little bit to help. 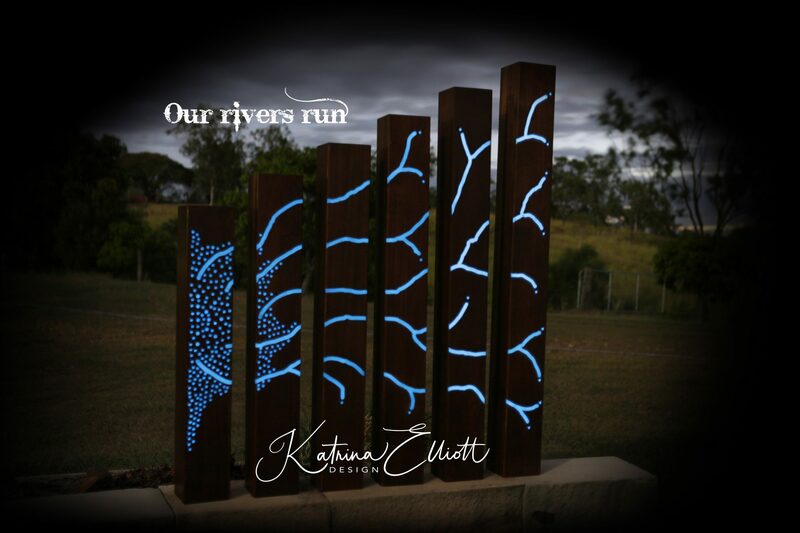 This outdoor sculpture comprising of 6 wooden pillars has been engraved and filled with illuminous resin. A lovely rich timber structure during the day followed by a bright cobalt blue illuminated by night. This sculpture will compliment anyone’s business, entertainment area or anywhere one wants to make a bold statement. So please bid at the auction and help us to help others.